With increasingly advanced shooting technology, we can use iPhone camera to shoot excellent videos to record the meaningful moments in our life. However, we have to face that the better videos will occupy more storage. With iPhone 7 or iPhone 6s, a several-minute video could be dozens of MBs. Wanna keep the videos and iPhone storage both? Well, we need to transfer iPhone videos to computer. Three ways about how to transfer videos from iPhone to computer by Windows built-in software or third-party software are introduced in the article. Find the best one for you. You can easily transfer your videos on iPhone to computer via Windows AutoPlay for free and what you need is just one cable. See the following steps. Step 1. Connect your iPhone to computer. And Windows will detect it automatically and the AutoPlay window will show. Step 2. 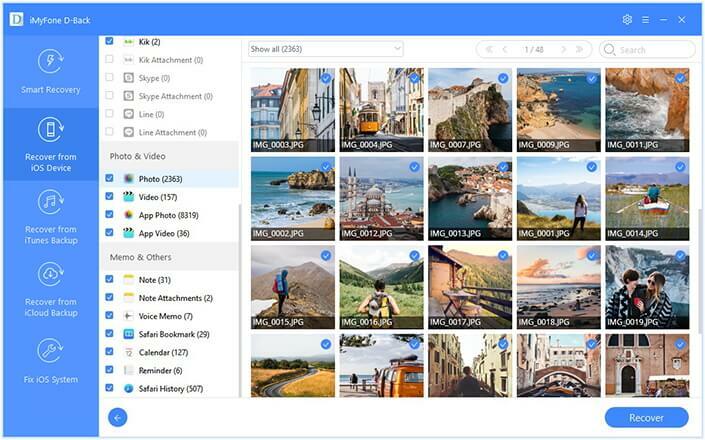 From the window, click “Import pictures and videos” option. Step 3. Click “Next” to navigate to the camera rolls groups and select the videos you need to transfer. Step 4. After setting the options, press “Import” and your videos will be transferred. You can also use your iCloud account to transfer your photos from iPhone onto your computer if you have turned Photos on from Settings > iCloud > Photos. Follow the easy steps to make that. Step 1. Log in your iCloud account on any of your browser on your computer. Step 2. Click on Photos and iCloud will show all your iPhone photos and videos which has been uploaded to your iCloud. Step 3. Check the videos you need to transfer and download them to your computer. You can also transfer your videos, and other iPhone data from your iPhone by 3rd-party data transfer tool. 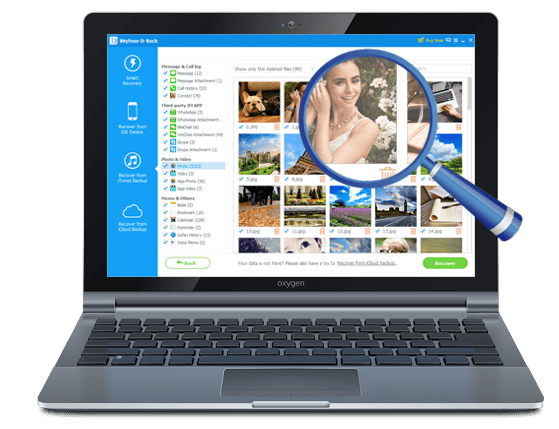 Armed with the most advanced technology, iMyFone D-Back (Windows/Mac version) is a good choice for you and it can do much more than data transfer. Preview your videos before transfer so that you will get what you exactly need. 20+ types of files can be transferred, such as texts, photos, voice memos, contacts, notes and more. Support iPhone 7/SE/6s/6/5s/5c/5/4s/4 running iOS 10/9/8/7. Can also do data recovery and iOS system fix. Step 1. Choose Video for Subsequent Scan. 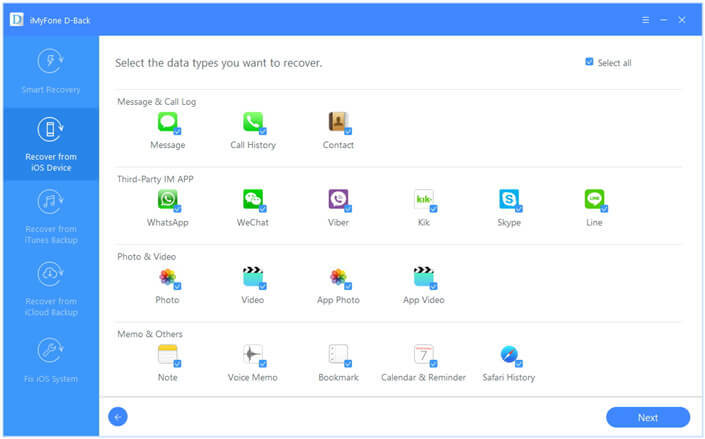 From Recover from iOS Device option, click start and you can see iMyFone D-Back can transfer 20+ types of files. Check Video and connect your iPhone. Step 2. Scan and Preview Videos on iPhone. The tool will take several minutes to scan your iPhone videos and then list them for your preview. After your confirmation, just check what you need to transfer. Step 3. Choose One Folder on PC to Store Videos. 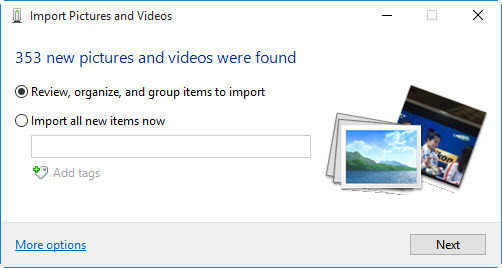 And then click Recover to choose or create a folder on your computer to store these videos. Then wait for several seconds, your videos are on your computer. Ta-Da! Now you have three different ways to transfer your videos from iPhone to computer and you can save huge storage for your iPhone! The first two ways are free, and even iMyFone D-Back (Windows/Mac version) offers the free trial version. Download and try the three ways all! How to Transfer Data from iPhone To Laptop? How to Transfer WhatsApp to New iPhone Xs/Xr/Xs Max?